Earlier this month, Herlan Manurung, Chef de Cuisine at Crossroads and Dan Giroux, General Manager at The Commons had the honor of attending MenuDirection 2019 - a culinary, business-building, and networking event for non-commercial segments. The pair learned from thought leaders, participated in culinary workshops, and received the Food Service Operation of the Month award that RIT Dining won in September. Check out the original article. To read more about what Herlan, Dan, and over 400 other attendees learned, including five menu trends that you might see popping up on menus soon, visit bit.ly/NewMenuTrends. 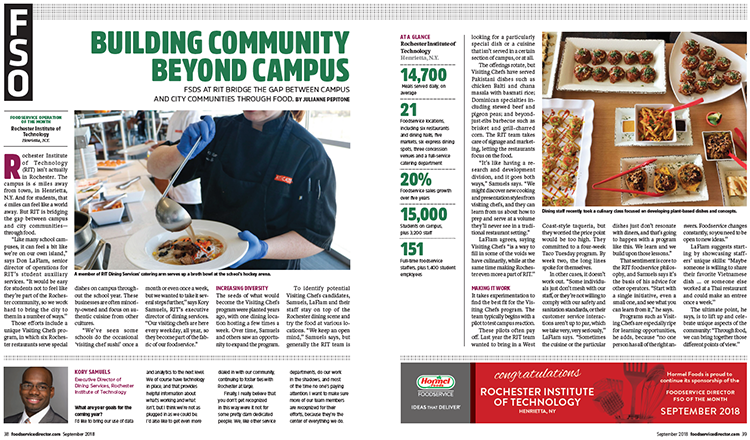 RIT Dining was recently featured in an article by FoodService Director Magazine, a national monthly publication for food service operators that delivers solutions and strategies to more than 45,000 highly targeted readers. They've been recognized because of their outstanding growth of over twenty percent in the past five years and their enthusiasm to work with other universities and healthcare providers to achieve the ultimate goal of providing the best food service experiences to customers. This article highlights a sample of what Dining has done through images, stats, and the visiting chef program and how they are unique compared to other food service operators. Please take a moment to congratulate a RIT Dining team member! The staff and students that make up this team give both seen and unseen effort that contributes to RIT Dining being considered a top tier Dining Services department. Click the image to view the full print article. View the digital version here. Attention customers with food allergies. Please be aware that our food may contain or come into contact with common allergens, such as dairy, eggs, wheat, soybeans, tree nuts, peanuts, fish, shellfish or wheat. While we take steps to minimize risk and safely handle the foods that contain potential allergens, please be advised that cross contamination may occur, as factors beyond our reasonable control may alter the formulations of the food we serve, or manufacturers may change their formulations without our knowledge. Our facilities are not food allergen or gluten-free. Customers with food allergies or other nutritional concerns are advised to notify the manager of any dining operation for assistance. The Dining Services Registered Dietitian, Mary Anne McQuay is available for additional information or support and may be reached at mamfsa@rit.edu. Food allergen and ingredient information is also available online through our NetNutrition web feature. Please be advised that baked goods may contain or come into contact with peanuts, tree nuts or other allergens. Customers are advised that all nutritional information posted on our website is calculated using a respected nutritional analysis software program. While information is based on recipes specific to RIT, nutrient values and allergens of each food may vary due to selected portion size, the use of condiments and seasonings by our customers, as well as growing conditions, manufacture formulations, or any substitutions. The information provided on our website is approximate and intended to be used as a guide only.